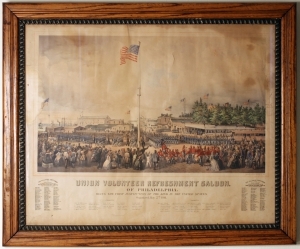 Showing Union troops arriving in Philadelphia from New Jersey via ferry and marching in formation towards the Union Volunteer Refreshment Saloon, cheered on by Philadelphians. Text at the bottom lists members of the committee and men willing to accept donations for the saloon. This image became a choice souvenir for soldiers passing through Philadelphia. [CIVIL WAR]. Print. Union Volunteers Refreshment Saloon of Philadelphia. James Queen, delineator and lithographer. Philadelphia: Thomas Sinclair, 1861. In period frame, 35 x 29 in. The Union Volunteer Refreshment Saloon was organized in South Philadelphia in 1861 by grocer Barzilla S. Brown. He began informally distributing food to Union troops traveling through Philadelphia, an important rail and steamer hub. The relief effort became official on May 27, 1861. The saloon provided soldiers with food, drink, stamps and paper, and offered traveling troops a place to rest. This initial effort differed in some ways from the later Sanitary Fairs that contributed to the care of sick and wounded soldiers. At this point, the civilian members were catering to the needs of healthy new recruits. In September, the Refreshment Saloon added a hospital to aid sick and wounded troops. The saloon supported itself through donations of food, clothing, cash, and later through admission cost to view the Confederate navy vessel Ram, which was captured in 1863. After providing social and medical services for four years, the saloon closed in late 1865. James Fuller Queen (1820-1886) apprenticed to learn lithographic draftsmanship. He drew a large variety of lithographs for large printing houses of Wagner & McGuigan, Thomas Sinclair, and P. S. Duval. He drew views of buildings, cities, scenic attractions, newsworthy events, portraits, sheet music covers, diplomas, illustrations for magazines, and other images. He also became an outstanding chromolithographer. His view of the “Union Volunteer Refreshment Saloon” is one of Queen’s most complex works and perhaps the one for which he is best known. He later drew the United States Sanitary Commission Fair in Philadelphia. Thomas S. Sinclair (c. 1805-1881) was born in the Orkney Islands of Scotland and studied lithography in Edinburgh and other cities. He started his own printing firm in Philadelphia in 1838. He was among the first in Philadelphia to experiment with color lithography. From 1854 to 1859, his brother joined him in the firm of Thomas Sinclair & Co. Later, his son worked with him in Thomas Sinclair & Son. He published three different hand-colored lithographs by Queen of Brown’s Refreshment Saloon and its friendly rival William M. Cooper’s Cooper Shop Volunteer Refreshment Saloon in 1861.